It might seem like a strange time of year to be publishing a barbecue recipe, but in my opinion it’s always hot somewhere! 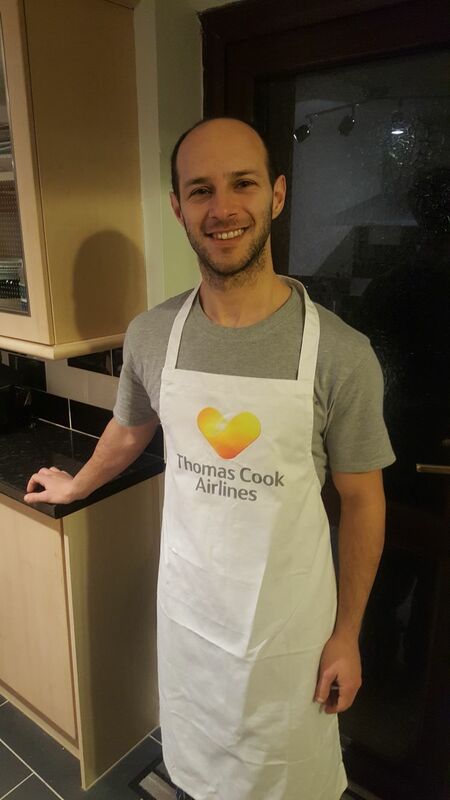 To promote this message further I’ve recently teamed up with Thomas Cook Airlines to bring you not only a delicious Mexican Barbecue recipe, but to give you the chance to fly off to a hot destination! How it works I’ll post a link through my Twitter account and you can then vote for your favourite recipe (hopefully it’s this one!) You’ll then be automatically entered into a draw to win a pair of tickets to one of the featured destinations! 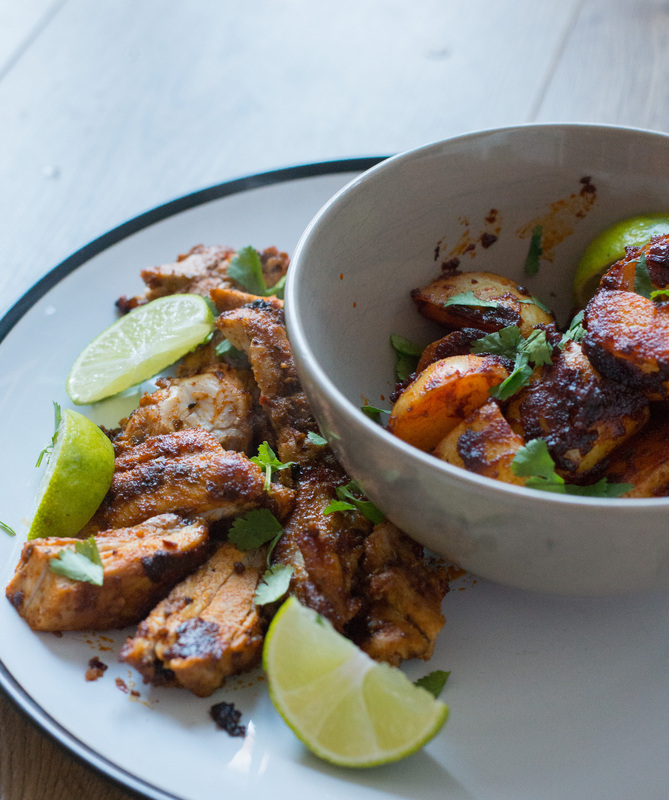 I came up with this recipe based on my favourite Mexican ingredients, particularly around Chipotle Paste which adds a really smoky heat to any dish and is perfect for a barbecue. I would strongly advise you marinate the chicken overnight to really allow the flavours to get through to the chicken. It will definitely be worth it when it comes to the eating part! So good luck in the competition and I hope you enjoy the dish. Place all of the marinade ingredients (except the lime juice) in a large enough zip-lock bag then refrigerate for 2-3 hours, or overnight if you have time. Pre-heat the grill to 220C (200C fan-assisted) Remove the chicken thighs from the bag and any excess marinade (reserve the marinade bag for later) then place under the grill for 25 minutes turning halfway. At the half-way point add the lime juice on both sides then return the chicken to the oven. (You can also place the chicken thighs onto a pre-heated barbecue for the same length of time). Meanwhile boil the potatoes for 15 minutes. With 5 minutes left place a large frying pan on a medium heat with a teaspoon of rapeseed oil. Drain the new potatoes and add them to the frying pan with the honey, smoked paprika, chipotle paste & seasoning. Cook for a further 5 minutes then set-aside topping with the fresh coriander. Remove the grilled chicken thighs and slice evenly then add them to the frying pan along with the reserved marinade from the bag. 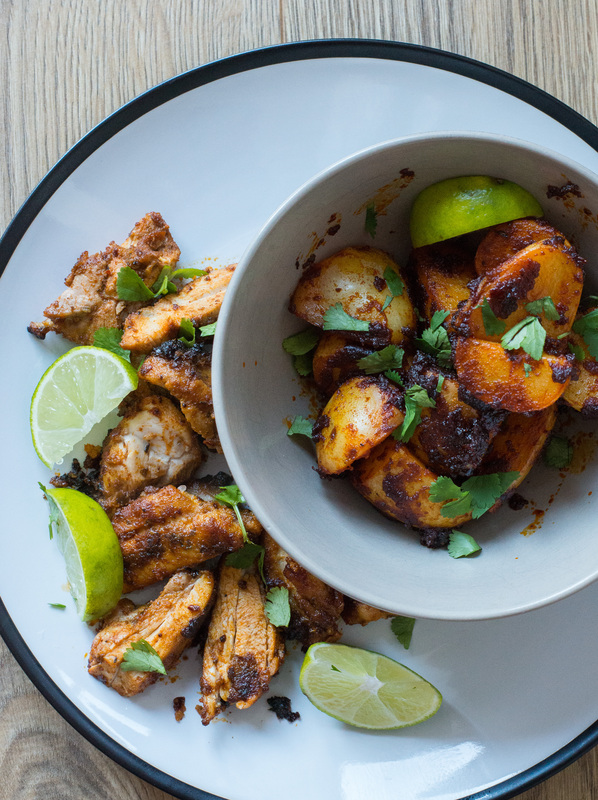 Increase the heat to medium-high, add the juice of the other lime half and cook for 3-4 minutes ensuring the chicken is well-coated throughout then serve with the chipotle potatoes.